Sometimes I see a recipe online that looks incredibly appetizing and the flavour profile jumps out at me. While I’m not a classically trained chef, I am a stubborn Puerto Rican. Polenta has been an issue of jokes in our house (aka fancy grits). After some research, I did find that it’s a different type of corn and the grind also makes the difference. So the difference between polenta and grits is left to palates far more distinguishing than mine. I decide to take a try at this yummy vision of seafood and comfort. This entire dish takes 30 minutes when done… in the right sequence… with a glass of wine. Bring the chicken broth to a boil over medium-high heat. While whisking gently, pour the cornmeal into the boiling water in a steady stream. Continue whisking until cornmeal is thickened. Turn down the heat to low and continue whisking until the cornmeal has thickened enough that it doesn’t settle back on the bottom of the pan when you stop stirring. 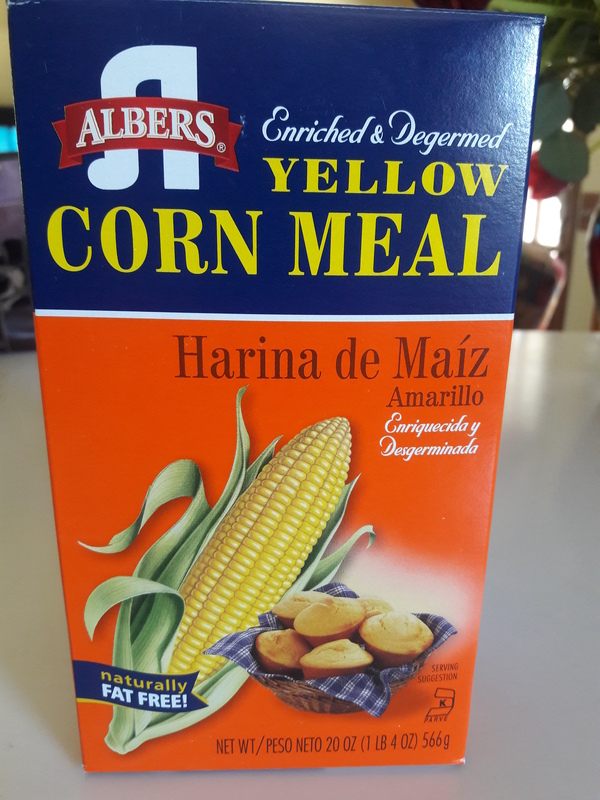 Cook the cornmeal (covered) 30-40 minutes. Stir vigorously every 10 minutes or so, making sure to scrape the sides, bottom, and corners of the pan. Stir in cheese and butter before serving. Next, let’s make the chimichurri. Chimi, as I like to call it, is a sauce or marinade traditionally used on grilled meat, typically containing parsley, garlic, vinegar, olive oil, and flakes of chili pepper. If you use basil you will get something like a pesto. Cilantro is another variation. I prefer to use corn oil as olive oil tends to congeal when cooled. To make the chimichurri sauce combine, cilantro, garlic, red pepper flakes, red wine vinegar in the bowl of a food processor; season with salt and pepper, to taste. With the motor running, add corn oil in a slow stream until emulsified; set aside. Shrimp and grits was the inspiration for this dish. Don’t go cheap on this ingredient…go jumbo! In food, the presentation is everything. Folks don’t typically eat food that looks displeasing. Have you ever seen those “nailed it” videos? It’s where average cooks have tackled some pintrest challenge with hilarious results… yeah that kinda happened. But there is no shame in my game. The flavours were perfect, the texture of my cornmeal polenta was creamy and cheesy, shrimp cooked up nicely. Leftover Polenta: Polenta will solidify into the shape of the container in which you store it. 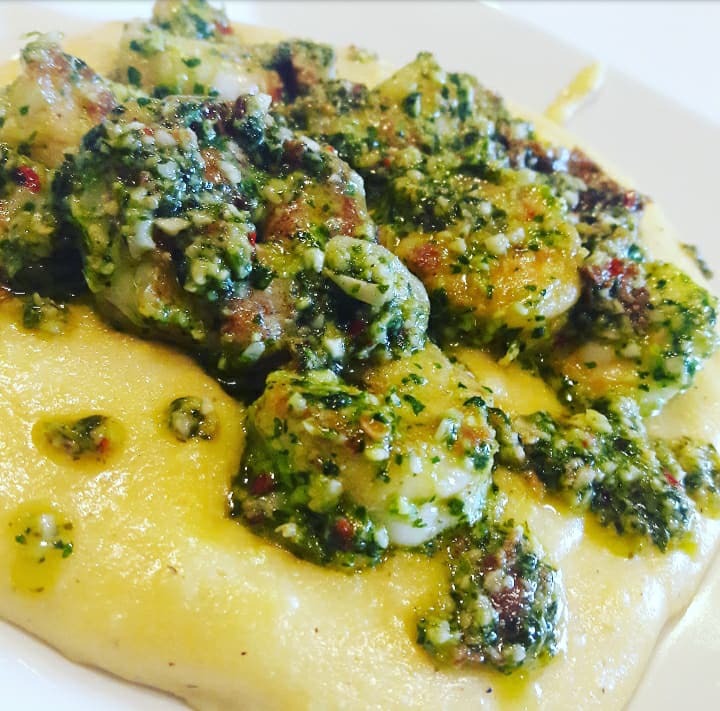 Leftover polenta can be sliced or cubed before being roasted, grilled, or deep-fried… aka sorullito, aka funchi, aka hushpuppy.